Check back next Thursday to see our picks for Week 3, and how the players performed that we picked the week prior. See the bottom of this article for details. In his first varsity start, Jasper threw for 361 yards and four touchdowns in a 59-26 loss to Valley Heights. And it wasn’t a result of quantity, as Jasper completed 18 passes for an average of better than 20 yards every completion. I expect Troy to roll this week on the road at Atchison County, which is coming off of a 79-6 loss to Nemaha Central. If Jasper can find his rhythm throwing early, then a repeat of last week’s stat line is likely. Lawrence senior running back Hunter Krom put up 334 yards and three touchdowns in the season-opening 42-21 win over Shawnee Mission Northwest. Similar to Chesty Lion running back Trey Moore, Krom (5-11, 190) hopes for a big senior season after losing the majority of his junior season due to injury. After being injured in Week 1 of the 2015 season, Moore went on to an all-state senior campaign last year in which he rushed for 1,307 yards and 19 touchdowns. This week, Lawrence gets another Thursday game against a Shawnee Mission North team that lost to Shawnee Mission South in Week 1. South had lost nine consecutive and 17 of their last 18 before a 22-19 win over SM North last week. After a Week 1 injury ended his junior season, TMP quarterback David McFarland started his senior campaign in record-breaking style. In last week’s 32-27 loss to Abilene, McFarland completed 41 of 63 passes for four touchdowns and a state record 648 yards. Can he reproduce those numbers this week? Not likely, but the Monarchs should have an opportunity to score even more points against an Ellis team that narrowly escaped Syracuse 18-12 in the opener. Ellis, who opened the 2017 season with just four returning starters from last year's squad, closed last season with five straight losses. TMP lost to Ellis 42-32 last year in Hays, this time they'll make the short trip west to Railer country. Pieschl delivered a breakout performance in Marysville’s 52-13 win over three-time defending 3A champion Rossville last week. He hauled in six passes for 192 yards and four touchdowns as the Bulldogs big-play threat. Pieschl’s classmate, senior quarterback Jack Blumer, passed for 315 yards and six touchdowns in the win. The duo helped Marysville win the Class 3A state basketball championship last spring with Pieschl named the 3A player of the year by Sports In Kansas. Marysville will look to duplicate that performance as they open North Central Kansas League play at home with Abilene. The Cowboys young defense gave up a single-game state passing record 648 yards in last week’s 32-27 win over Thomas More Prep. If Marysville can keep the offensive momentum going, there is little chance of a 14-12 decision like Abilene won a year ago. The Bulldogs have lost the last eight games in the series with Abilene, last winning 34-13 in 2008. Few things in Kansas high school football are more consistent than the Lancers’ offense and single wing attack. Spearville had posted records of 8-2, 10-1, 13-0 and 11-1 from ’13-16 before winning its season opener last week, 48-0, against Hill City. In that span, the Lancers produced 51.8, 52.4, 55.4 and 54.7 points per contest. From ’12-16, Spearville averaged between 266 and 298 rushing yards a game. Against Hill City, the Lancers rushed for 289 yards and averaged 11.6 yards per carry. Spearville’s brand-new offensive line features senior Wyatt Stimpert at center, senior guard Levi Stein, junior tackle Albert Evins, along with senior end Nate Heeke and sophomore Carson Rich. The Lancers are at rival Hodgeman County. Spearville has won three straight in the series with scores of 50-28, 46-0 and 38-6. Swinehart, now a senior, had 10 touches on the offensive side of the ball last week and scored four times. He had 82 rushing yards and 180 receiving yards as Lyndon easily handled Yates Center. Swinehart has been an all 2-1A player in each of the last two seasons for Lyndon and produces nearly every time he touches the ball. Swinehart has 2,836 career rushing yards with 37 touchdowns, and 1,345 more receiving yards with 15 touchdowns. He has 4,696 yards of all-purpose yardage in his career dating back to his freshman year. 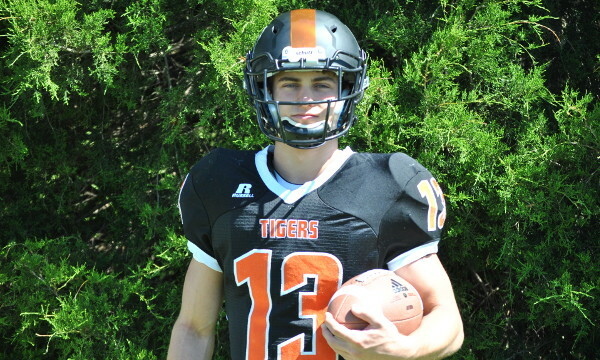 If Lyndon continues to find way to get Swinehart the ball, the Tigers will be a contender on east side of Class 2-1A. After a breakout sophomore season last year in leading Pratt to the Class 4A Division II state title, including a dominating performance in the state title game, Theis is off and running in 2017. He burned Larned for 437 yards and six touchdowns in a 56-46 shootout in last week’s season-opener. Pratt probably won’t give up as many point to Haven this week, which could limit Theis touches, but Haven gave up six rushing touchdowns to Nickerson’s Peyton Kuhns last week so Theis may not need many carries to rack up huge numbers. The junior rushed for 255 yards and three touchdowns on 17 carries, while completing 8 of 9 passes for 163 yards and a touchdown during a 30-20 win over La Crosse. Whisennand, a wide receiver in 2016, took over the quarterback duties for Tyler Sklenar, who started for three years before signing to play at Kansas Wesleyan.. Whisennand will lead the Wildcats against 1-0 Southwestern Heights this week. Nate Heneha, QB, Hutchinson Central Christian – Neneha completed 13 of his 14 pass attempts for 159 yards and three touchdowns in the Cougars’ 90-38 win over Pretty Prairie. The senior quarterback also rushed for 145 yards and two more scores as Central Christian put up 678 yards of total offense. (Maycock – 59 pts) *Stats updated from initial post per HCC Coach Lee Smith.